World 4- Castle is the Castle level of World 4 in New Super Mario Bros. 2. The boss is Morton Koopa Jr., and the castle mostly features Snake Blocks and Spiked Balls. Mario begins under a Spiked Ball enclosed in Snake Blocks. Two ? Blocks can then be found, one of them containing a Super Leaf or a Super Mushroom. Snake Blocks can then be found pushing Spiked Balls around the floor. A multi-coin Brick Block can then be found very near to a Fire Bar. This is followed by an area with Snake Blocks on the ceiling controlling the fall of Spiked Balls, where a Dry Bones can be found. A Roulette Block follows, along with more Fire Bars. A P Switch can be found below the first Star Coin, causing Blue Coins to appear. An area with more Snake Blocks on the ground, a single Dry Bones, a Fire Bar and several Spiked Balls can be found. This is followed by the Checkpoint Flag, where another Super Leaf can be found in a ? Block. Another area where Snake Blocks push the Spiked Balls on the ground can be found. More Snake Blocks can be found with a Dry Bones, where Spiked Balls occasionally drop down from the ceiling. This is followed by a Fire Bar and a red pipe below another ? Block with a Super Leaf. After that comes a fork in the path separated by Snake Blocks. The upper path has a single Giant Spiked Ball moving quickly while the bottom has two slow-moving Giant Spiked Balls. Both paths leads to the boss door. The boss that Mario has to defeat here is Morton Koopa Jr., taking place in a room with slanted platforms. His attacks are making Spiked Balls roll down towards Mario and also shaking the ground to stun Mario. Mario needs to stomp on him three times. He performs his shell attack each time while spinning down the path the Spiked Balls would originally leave the room, then he returns with a large Warp Pipe on the ceiling. Defeating him takes Mario to World 5. Star Coin 1: This Star Coin is enclosed by the ceiling somewhere before the checkpoint. There are two ways to obtain this Star Coin. One way is to use Raccoon Mario to fly to a gap (which cannot be seen) above the Star Coin and obtain it. 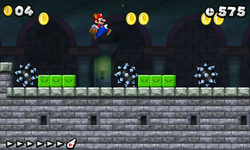 In the absence of Raccoon Mario, Mario should not collect the preceding four coins and instead activate the P-Switch to change these coins into Brick Blocks which can be used as platforms to reach the opening to the Star Coin. In the case where the coins have been collected, a Super Leaf can be found further down near the checkpoint which is not far away. Star Coin 2: The Star Coin is just after the checkpoint which is occasionally obstructed by the second giant Spiked Ball. The Star Coin can be obtained by quickly dropping to it and jumping out when the Spiked Ball is moving away before the moving Snake Block pushes it back, or collecting a Super Star from the Roulette Block and destroying the Giant Spiked Ball. Star Coin 3: When reaching the red pipe specified above which is located after the area where Spiked Balls fall from the ceiling, Mario needs to warp inside to enter another room with Snake Blocks and Spiked Balls. Mario will need to make his way up the moving Snake Blocks to reach the Star Coin. This page was last edited on April 13, 2019, at 08:51.